An Israeli firm has introduced lab-grown steaks the size of a credit card that was eaten immediately after it was grown. Cell-cultured meat takes tissues from living animals and turns it into food using scientific techniques and lab incubation, according to Daily Mail. Previously, mincemeat and chicken nuggets have been created but scientist have failed to grow a complex animal tissue structures, such as steaks. 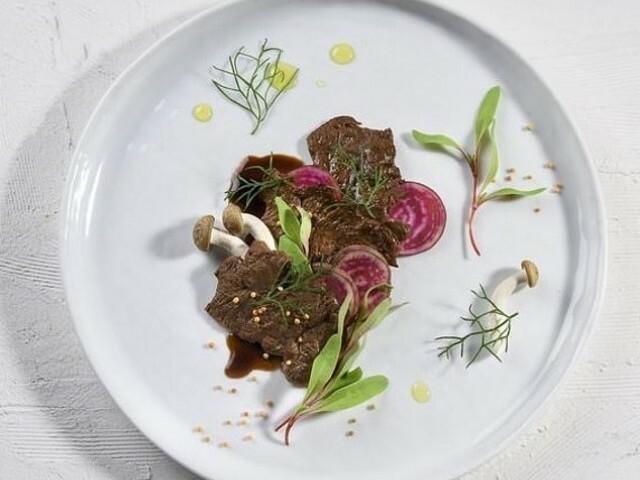 Biotechnology firm Aleph Farms claims to have grown slaughter-free meat in its labs with the same texture and flavour as the real meat. This latest technology comes at a time when a growing number of people are waging an ethical war against the human consumption of meat. Cattle farming and agriculture continue to consume vast amounts of usable land and are also the leading contributor to global greenhouse emissions. Two incubators, named Alberto and Gertrude, are where several Petri dishes are growing with cells from two cows which remain alive and well. They simulate the conditions inside a cow to produce the most specific cells possible. A complex series of experiments then develop four different types of animal tissue; support cells, fat cells, blood vessel cells and muscle cells. These are then combined to form a complex shape and after three weeks produces a fully-fledged steak. Technology for ‘cruelty-free meat’ is still evolving and the firm claims it would cost approximately $50 for a single piece of the thin steak. Didier Toubia, CEO of Aleph Farms said that the taste and flavour are ’60 – 70 per cent’ of the way to the desired goal and product will not be available commercially for at least two years. ‘In theory, we’re talking you could be eating bison meat without killing bison. You could be eating whale without harming whales,’ says Jan Dutkiewicz, a researcher at Johns Hopkins University. Development of the technology has been steadily progressing, with Just Food, a San Francisco-based firm, working on using plant protein to create meat replacements. The company claims its non-chicken nuggets will be available before the end of 2018 and has today announced a partnership to develop and market a cell-cultured version of the upmarket Japanese beef Wagyu. ‘Precious few have had the chance to experience umami Wagyu and we hope this partnership allows more restaurants to share Toriyama beef and its story in a new, exciting way,’ Just co-founder and CEO Josh Tetrick asserted in a statement. The meat industry is said to be one of the world’s most dominant sectors and requires an immense amount of resources that are responsible for climate change and degradation of the environment.